Global cannabis beverages market expected to generate around USD 4,464 million by 2025, at a CAGR of around 15.6% between 2019 and 2025. Cannabis beverages are gaining popularity in the market due to the rising demand for wellness beverages by the consumers. The report covers a forecast and an analysis of the cannabis beverages market on a global and regional level. The study provides historical data for 2017 and 2018 along with a forecast from 2019 to 2025 based on revenue (USD Million). The study includes drivers and restraints of the cannabis beverages market along with the impact they have on the demand over the forecast period. Additionally, the report includes the study of opportunities available in the cannabis beverages market on a global level. In order to give the users of this report a comprehensive view of the cannabis beverages market, we have included a competitive landscape and an analysis of Porter’s Five Forces model for the market. The study encompasses a market attractiveness analysis, wherein all the segments are benchmarked based on their market size, growth rate, and general attractiveness. The report provides company market share analysis to give a broader overview of the key players in the market. In addition, the report also covers key strategic developments of the market including acquisitions & mergers, new service type launch, agreements, partnerships, collaborations & joint ventures, research & development, and regional expansion of major participants involved in the market. The study provides a decisive view on the cannabis beverages market is segmented based on type, end-use, distribution channel, and region. By type, the global cannabis beverages market is segmented into alcoholic and non-alcoholic beverages. The alcoholic cannabis beverages market is further segmented into cannabis-infused beers, cannabis-infused spirits, cannabis-infused wines, and others. The non-alcoholic cannabis market is further segmented into marijuana tea, marijuana elixirs, cannabis soda, and cannabis coffee and cold brew. By end-user, the global cannabis beverages market is categorized into household and HoReCa. By distribution channel, the cannabis beverages market is segmented into B2B and B2C (convenience stores, hypermarkets, specialty stores, online stores, and others). By geography, the global cannabis beverages market includes North America, Europe, Latin America, Asia Pacific, and the Middle East and Africa. All the segments have been analyzed based on present and future trends and the market is estimated from 2019 to 2025. 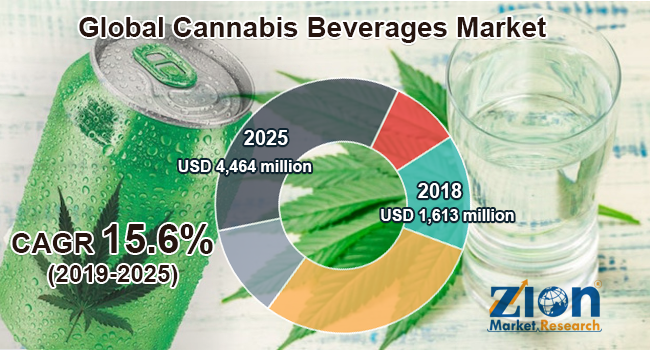 This segmentation includes the demand for cannabis beverages market based on all segments in all the regions and countries. Some key players of the global cannabis beverages market are Beverages Trade Network, Coca–Cola, Lagunitas, The Alkaline Water Company, New Age Beverages Corporation, COALITION BREWING, Dutch Windmill Spirits, Heineken, Klosterbrauerei Weißenohe, SK Rodnik, Koios Beverage Corporation, The Supreme Cannabis Company, General Cannabis Corporation, Heineken, Coalition Brewing, Bhang Corporation, and Cannabis Energy Drink.